It&apos;s no secret that I&apos;m an advocate of mineral sunscreens—especially when it comes to your face. 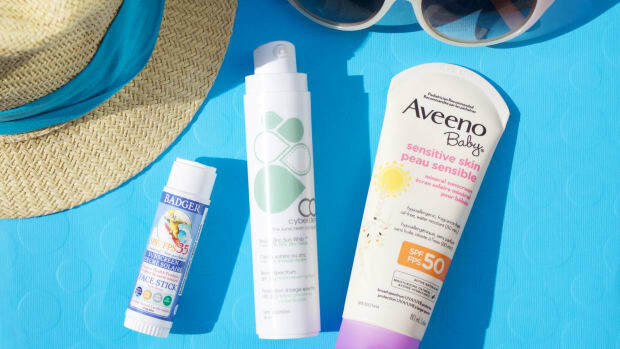 Not only are they MUCH safer for your health than chemical sunscreens, they&apos;re also less likely to trigger skin reactions and heat-induced pigmentation. That&apos;s because zinc oxide and titanium dioxide work by sitting on the skin&apos;s surface to reflect away the light, instead of penetrating into the bloodstream (where chemical filters actually absorb UV energy). But guess what? It&apos;s not enough to simply grab any SPF with "mineral" on the label! 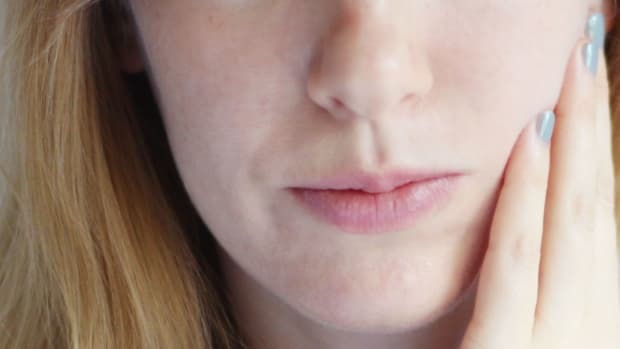 As I explained here, most products on the market don&apos;t include high enough levels of actives, lack true broad-spectrum protection, or contain other damaging ingredients. High-zinc: Zinc oxide offers the best protection against UVA and UVB rays. Sunscreens should contain at least 20 percent zinc oxide as the active ingredient, or 15 percent zinc oxide with 7.5 percent titanium dioxide or encapsulated octinoxate. AHA-free and vitamin A-free: Alpha-hydroxy acids and vitamin A derivatives can increase UV sensitivity, so they should not be present in any significant amounts (which is the case for all of my selections here). Silicone-free or low-silicone: There&apos;s no safety reason to avoid silicones, but I think it&apos;s a good idea to limit them if possible. Their film-forming action can be comedogenic and dehydrating, and interferes with the skin&apos;s natural regulatory processes. Non-whitening: The most cosmetically elegant sunscreens use micronized forms of zinc oxide and titanium dioxide because their smaller particle sizes are less likely to leave a white cast. But what about nanoparticles, you ask? According to EWG, nearly ALL sunscreens would be considered nanomaterials despite their "non-nano" claims—but there is no evidence that they penetrate the skin or cause any significant harm. For that reason, "non-nano" isn&apos;t one of my criteria. Ready to see which sunscreens measure up? Here we go! CyberDerm Simply Zinc Ultra Transparent Sunscreen Lotion SPF 50 is the new and improved version of Simply Zinc Sun Whip—one of my all-time favourite beauty products, and the first TRULY effective sunscreen I ever discovered. (Now, there are a lot more high-zinc offerings, but a few years ago, that wasn&apos;t the case at all!) Made in Canada, it has the highest zinc oxide contents on the market, 25 percent, in a lightweight base with a sheer tint. The Derma E Sun Defense Mineral Oil-Free Sunscreen SPF 30 Face is a reformulation of the brand&apos;s original sunscreen, and now it&apos;s even better! They bumped up the zinc content to 20 percent, but it still has the same lightweight, oil-free lotion texture. That&apos;s why I think it&apos;s one of the better options for acne-prone skin. Note: If you can&apos;t find it, grab the baby version because the ingredients are exactly the same! Attitude 100% Mineral Sunscreen SPF 30 Fragrance-Free may be intended for kids and families, but it also makes a fantastic face sunscreen for all ages—because of its 20 percent zinc, fragrance-free formula with minimal ingredients. The cream-gel texture requires a bit of blending, but leaves a nice semi-matte finish. Attitude Sensitive Skin 100% Mineral Sunscreen SPF 30 is a 20 percent zinc sunscreen made with dry and sensitive skin in mind. Certified by the National Eczema Association, it&apos;s enriched with one percent colloidal oatmeal, which reduces itching, redness and inflammation. The texture is creamier and initially, a tad stickier than their regular SPF, but it dries down beautifully. If your skin tends to be reactive, this is perfect for you. Rocky Mountain Soap Company Vanilla Coconut Natural Sunscreen SPF 31 has 20.1 percent zinc oxide in a formula with natural ingredients. It has a creamy texture, but is easily spreadable. It also has a slight beige tint, so it doesn&apos;t go on white. Once massaged into the skin, there&apos;s a little dewiness, but I find that goes away after about 20 minutes or so. The Juice Beauty SPF 30 Oil-Free Moisturizer is not only chock-full of zinc (20 percent), but also has tons of antioxidant-rich botanical extracts and hyaluronic acid. The texture is light and the white hue disappears really fast. I have no idea why some reviews are describing it as "greasy," because I wouldn&apos;t say that at all. I can&apos;t even feel this on my skin! It&apos;s one of my top picks for anyone who is oily or who only wants lightweight hydration. Attitude 100% Mineral Face Stick SPF 30 is the stick version of the brand&apos;s lotion-textured sunscreen. It has the same percentage of zinc oxide, 20 percent, with olive oil, cocoa and shea butter to help it glide across the skin. I always like having a stick in my handbag for on-the-go protection. It&apos;s also ideal for the lips! Your other stick choice is the Badger All Season Face Stick SPF 35, which has an even higher level of zinc, 22.5 percent, and an even shorter ingredients list. This is the single cleanest, most natural sunscreen formula I&apos;ve found. Just keep in mind that the finish isn&apos;t the most elegant—it goes on thick and white, so needs lots of rubbing in. CyberDerm Every Morning Sun Whip SPF 25 is the only sunscreen I&apos;ve seen that combines 15 percent zinc oxide with 7.5 percent encapsulated octinoxate. Although a chemical filter, the encapsulation makes the octinoxate behave like a mineral, sitting on top of the skin. The texture is lightweight and matte, so it&apos;s ideal for oily skin. Drunk Elephant Umbra Sheer Physical Daily Defense SPF 30 has 20 percent zinc oxide and a lovely light texture. Some people say they can detect shimmer in this formula, but I really haven&apos;t seen that on my skin at all! If you really want to avoid any whitening effects, there&apos;s Drunk Elephant Umbra Tinte Physical Daily Defense SPF 30, a tinted form of their original SPF. (It also has 20 percent zinc oxide.) I would go for this one if you have a medium-to-dark skin tone; I find it&apos;s a little too deep for my fair skin. Shiseido Ultimate Sun Protection Lotion SPF 50+ WetForce for Sensitive Skin & Children would be my top recommendation if you&apos;re swimming or sweating a lot, as it is water-resistant for up to 80 minutes. It actually becomes MORE effective when wet. You&apos;re also getting high protection with 19.3 percent zinc oxide and 9.1 percent titanium dioxide. I&apos;m guessing the high silicone content helps it stay on the skin better. It&apos;s also more whitening than most. But for its intended purpose, it really does the job! With Neutrogena Sheer Zinc Face SPF 50, there&apos;s finally a decent sunscreen from a mainstream drugstore brand! I&apos;m so pleasantly surprised at how much zinc they put in here. At 21.6 percent, it&apos;s the highest I&apos;m aware of at this price point. As usual, they packed it with silicones, but like the Shiseido, it is water-resistant for 80 minutes, and oil-free. Kosmea Moisturising Lotion SPF 30 is an all-natural sunscreen lotion with 20 percent zinc oxide. This one has a slight tint, and the feel is super lightweight! Suntegrity Natural Moisturizing Face Sunscreen & Primer SPF 30 is a hydrating sunscreen that should easily allow you to skip moisturizer. Thanks to a little bit of silicone, it also acts as a primer under makeup. There&apos;s 20 percent zinc oxide in here. Suntegrity 5-in-1 Natural Moisturizing Face Sunscreen SPF 30 is similar to a tinted BB cream, and is available in four shades. This one has 20 percent zinc and is perfect if you&apos;re looking for a sunscreen that can replace your regular skin makeup. Finally, we have the Block Island Organics Natural Mineral Sunscreen SPF 30, which I discovered via EWG. I love that it&apos;s got one of the highest concentrations of zinc, 22 percent, in an aloe base. Choose a high-zinc mineral sunscreen for the best and safest level of protection. 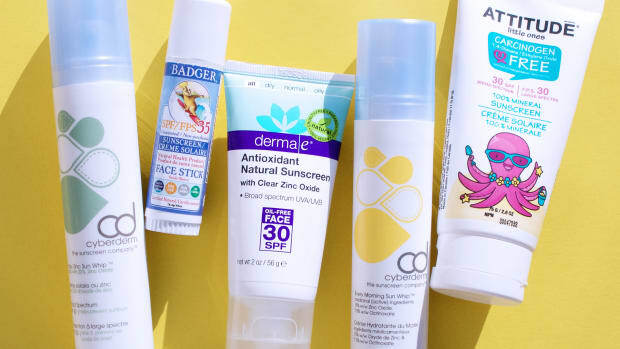 Now, you&apos;re up to speed on all the best sunscreens available for your face! You&apos;ll notice that I didn&apos;t include powder sunscreens, which exist in a bit of a regulatory grey area, and should only be used to top up your existing protection. (More on those over here.) I&apos;d always recommend applying one of these high-zinc lotions FIRST, to ensure you have a proper base on that blocks out both UVA and UVB. I also want to acknowledge that I understand the aesthetic challenges with using mineral sunscreens, even the so-called "non-whitening" formulas. I get it, and I know I have it easy as a pale person! But if the only alternative is to wear a harmful chemical SPF, I think it&apos;s worth the effort trying to work with them. That may mean spending more time letting your sunscreen sink in and/or blending out the initial white cast. I&apos;ve had the best luck with silicone-free makeup on top, which doesn&apos;t cause any pilling for me. I usually wear my favourite SPFs with my beloved RMS Beauty "Un" Cover-Up and some silica powder to get rid of the excess dewiness. And I try to pat the makeup on, not buff it, so I don&apos;t disturb the layer of sunscreen. Hopefully, this helps guide you toward some great sunscreen choices this summer. Next up, check out the best high-zinc BODY formulas! Have you switched to a zinc oxide sunscreen?